Posted on Monday, March 5th, 2012 at 11:02 am. Middle East-based author and logistics expert Issa Baluch launched his second book at the recent FIATA World Congress 2010 in Bangkok. A special ceremony was hosted to unveil the book – titled ‘Transport Logistics: The Wheel of Commerce’ – with guests including Thai government officials, FIATA board members, lecturers and logisticians from 70 countries around the world. Transport Logistics: The Wheel of Commerce examines the impact of the 2008 recession on the industry, and argues that the industry itself serves as a harbinger of both up and down turns in the economy. The book also discusses the status of transport logistics planning and preparation in 11 countries: Canada, Chile, India, Singapore and the United Arab Emirates (UAE), plus six in Africa—Burundi, Ethiopia, Ghana, Kenya, Rwanda and Tanzania. 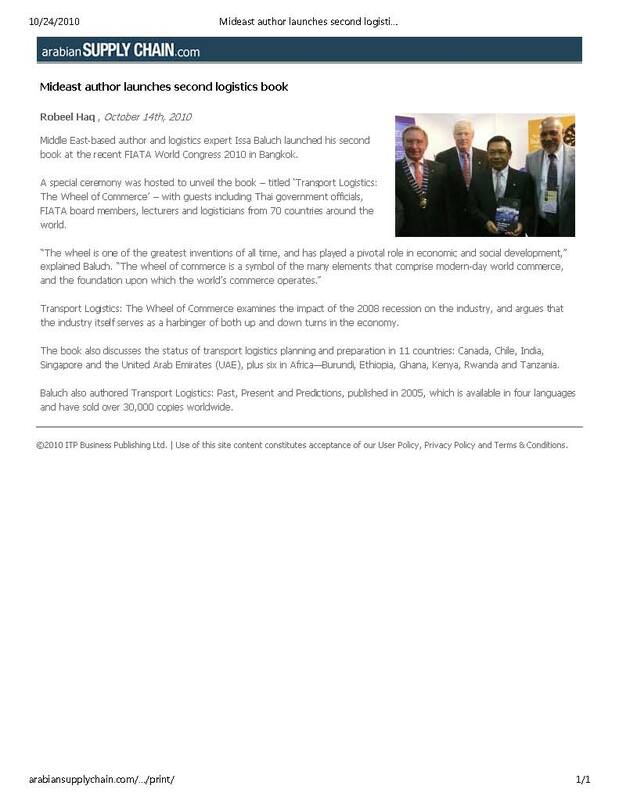 Baluch also authored Transport Logistics: Past, Present and Predictions, published in 2005, which is available in four languages and have sold over 30,000 copies worldwide.